Environment Minister Catherine McKenna tells staff she will leave most days at 5:30 to see family at least for a couple of hours. I did’t write this article – Catherine Porter did and it was first published on January 8, 2016 in The Toronto Star - but I’m cited in it, which I think is honestly, almost cooler. And I love, love this picture of Catherine and her youngest. 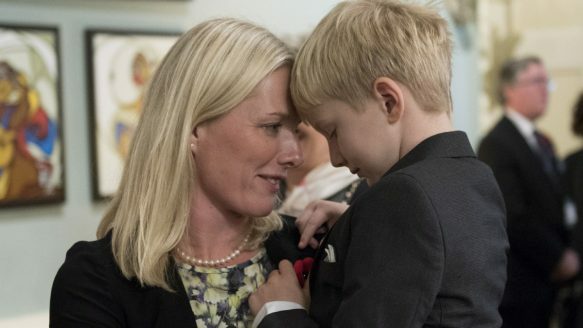 Minister of Environment and Climate Change Catherine McKenna speaks with her son before a swearing-in ceremony on Nov.4 in Ottawa. She says that she is going to take time off each day to spend with her family. Like many of us, Environment and Climate Change Minister Catherine McKenna arrived at work this week with fresh New Year’s plans. There’s greenhouse gas reduction, for one. And, then there is the dreaded work-life balance. McKenna has a husband and three children — 11, 9 and 7. She announced to staff Monday that she intends to be out of the office every day at 5:30 p.m. sharp, except Thursdays. Once she is home, she will be offline for a couple hours, to do homework with her children, oversee lessons and sit down to dinner, together as a family. “I am not going to be a good minister unless I’m happy at home and my family’s happy and there’s some balance,” she said over the phone. Her new rule has it that about 8 p.m., she will again take up work duties. Work-life balance is a hot topic among new MPs and parliamentary staff, McKenna said. More to the point: they want to have their new jobs and keep their families, which for MPs is akin to wanting to have a natural Hollywood body. Traditionally, Parliament Hill is a place men go for power and families go to die. The long hours, the constant distraction and for most MPs, the weeks not just at work but a plane ride away in Ottawa are too much of a strain on relationships. Alison Loat and Michael MacMillan interviewed about 80 departing MPs for their book Tragedy in the Commons. “The personal cost of political life was a subject that recurred again and again in the interviews, unbidden,” they write. Before Christmas, Trudeau reminded cabinet ministers it was important for them to spend their vacation time with their families, McKenna said. In an op-ed she wrote with Reva Seth in the Ottawa Citizen in 2014, McKenna suggested steps like video-conferencing and condensed parliamentary sessions, so commuting MPs could spend more time at home. They also suggested an end to evening parliamentary meetings, so mothers could get home for bedtime. Queen’s Park changed its hours to accommodate parents in 2008 and Alberta is following suit. Equal Voice, the group lobbying for more female politicians, is pushing for similar schedule changes in legislatures across the country, because its members see the regular late-night sessions as a major impediment for mothers deciding to run as MPs in the first place and once elected, sticking with the job. In the last federal election, only a third of candidates were women. “It’s not just a women’s issue, it’s a parent issue,” said McKenna, 44. But work-life balance cannot be solved simply by scheduling. McKenna will have to sleep at some point. If the Liberals really want to make Parliament more “family-friendly,” they will have to address the culture of overworking, which is, as Anne-Marie Slaughter points out, a sickness not just in government, but most of corporate North America. Slaughter quit her job running the U.S. State Department’s policy planning after two years, because she couldn’t do the job and be a good mother to her son, who was going through a rough patch back home. She wrote about it the Atlantic magazine in an article called Why Women Still Can’t Have It All, but her point is that no one can have it all when the work culture expects 24-hour devotion. Now, if Trudeau did that, it would be truly revolutionary. We all break New Year’s resolutions. I hope our new minister is the exception — not just for her and her family, but for the rest of us. ← Should We Teach Kids To Monetize Their Passions?